(Medical Xpress) -- A protein that has been linked to Alzheimers disease and cancer is at the center of groundbreaking research by a team of Colorado State University scientists. 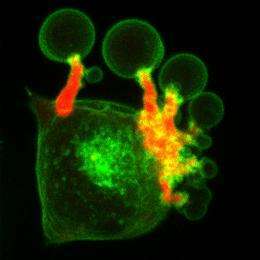 The team found that the protein, called cofilin, regulates the forces that are essential, for example, for cells to migrate around the body. The research appears this week in Developmental Cell journal. Scientists have known that mutations to cofilin in mice create defects that lead to disease similar to those that affect humans; for example, where the nervous system doesnt develop properly. Theyve also known that cofilin is responsible for assembling and dissembling F-actin, a polymer that provides the scaffolding that gives cells their shape. But Colorado State scientists have now discovered a new behavior of cofilin that helps them understand more about how defects are created when cofilin is lost from cells: The protein helps regulate the forces generated by a class of molecular motors known as Myosin II, said ONeil Wiggan, a research scientist and lead author on the paper. Other authors include biochemistry professors Jim Bamburg and Jennifer DeLuca and research associate Alisa Shaw. Myosin II is part of healthy cells, too, but they must have the proper propulsion behind them. Excessive force can cause deviation in cells and propagate unhealthy cells. Wiggan compared it to the force required to hammer a small nail vs. hitting a pole in the ground  different forces are required. The revelation ultimately could help scientists design treatments for cancer and disease. Cofilin controls forces that direct not just the morphology but many different aspects of cell function  such as migration and division, Wiggan said. Understanding how cofilin plays a role in controlling these forces means we might be able to develop therapeutic targets for treating diseases such as cancer where these forces become deregulated. These contractile forces power cell migration, and cell migration is what is required for metastases, which is the deadly part of cancer, Wiggan said. Another feature of cancer tissues is that they stiffen, as in breast cancer. By controlling the forces that cause that stiffness, the cofilin pathway may contribute to tumor development, Wiggan said. Scientists generally have linked cofilin function to such diseases as Alzheimers, spina bifida and Hirschsprungs disease. While the new CSU paper sheds light on cofilin behavior, more research is needed. How do cells travel through our bodies?